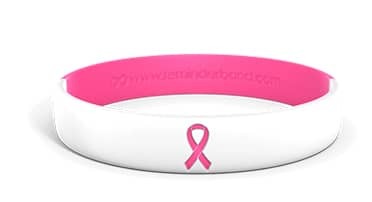 Reminderband® wristbands are made from thick 100% silicone, making them durable and long-lasting. To ensure the highest-quality silicone bracelets, Reminderband® conducts ongoing production tests and research. Please note that we do not guarantee color since screen color never perfectly matches the physical product color. Also, we do not guarantee fit since that is subjective by customer--some like it tight, and some like it loose. For the best fit, see our Sizing Guide below. You may also order free random samples to check color/size prior to customizing. Reminderband® currently carries 39 colors in stock. Our in-stock color selection will continue to grow as demand increases, and custom colors are available on large quantity orders (200+ wristbands). Colors may vary slightly depending on your monitor display settings. 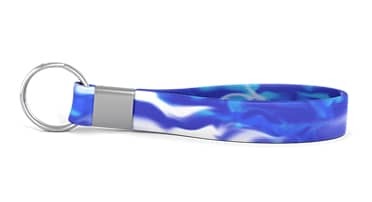 Artwork, logos, color-fill text, marbleized, and multi-colored bands are available as additional customization options. If you need help deciding on a color, check out our Color Guide. Reminderband® currently stocks 7 types of striped bands. Black-Blue-BLack, Red-White-Blue, and Red-White-Red are some of our most popular colors. 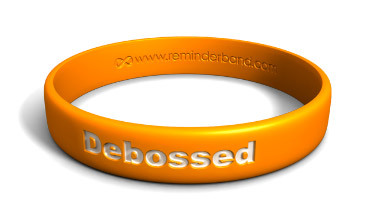 Reminderband® can silkscreen any color on any of our classic wristbands. Choose from our base colors or make a request for a custom color. Please note that the first color is included in the price, but any additional color is $20. 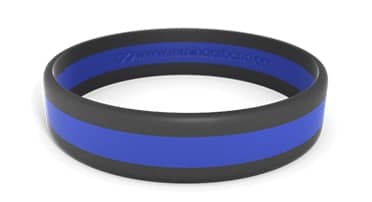 Reminderband® uniquely provides over 3,000 different color combinations for the 3-color segmented wristbands. Mix and match various color to match your school's or your favorite sports team's colors. Also offered in hundreds of 2-color combinations. 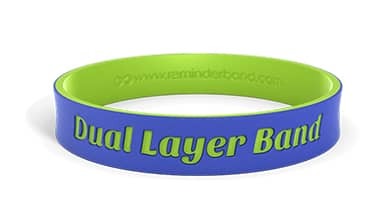 Reminderband® currently stocks 10 types of dual-layer bands. We deboss the outer layer deep enough to see the inner layer. It is a very stylish and beautiful look. We sell both keychain and necklace medical alert dog tags with a beautifully sculpted caduceus on the front and plenty of area for debossing underneath and on the back. Dog tags without the caduceus are also available. 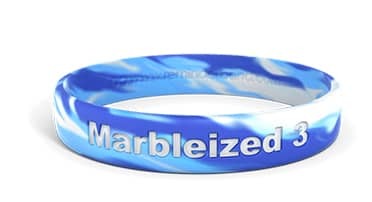 Below is a sampling of Reminderband® specialty wristbands including our very popular Thin wristband, Golf wristband, Tire wristband, Puzzle Wristband, Marquee Rectangle, Marquee Oval, Wristband Keychain, and Dog Tag. 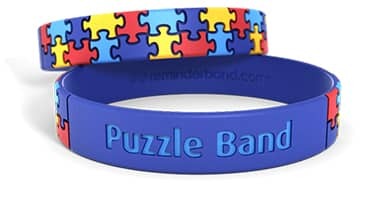 The Puzzle wristband is perfect as an autism bracelet. 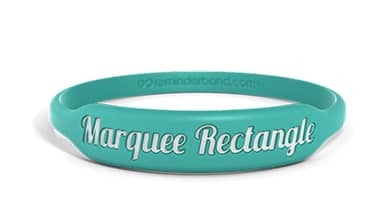 The Marquee family is great for medical alert bracelets. The wristband keychain is durable and highly visible. 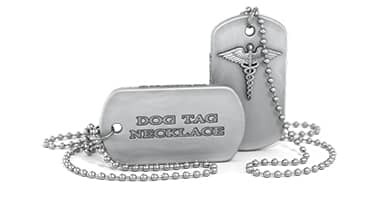 The dog tag can be purchased either as a keychain or as a necklace. We also offer it with a beautifully embossed medical alert symbol on front (a caduceus). Each of these is offered in a large variety of colors. Reminderbands® come in three main sizes: large, medium, and small. The large bands are 8 3/8" in length and will fit most adults and large-framed teenagers. The medium bands are 7 3/8" in length and generally fit ages 11 and up, including most teenagers and average women. The small bands are 6 6/8" in length and typically fit children 6-10 years old. Extra-large sizes are available upon request from our customer service team. All Classic-style bands are .08" (2.4mm) thick and 1/2" (12 mm) wide. 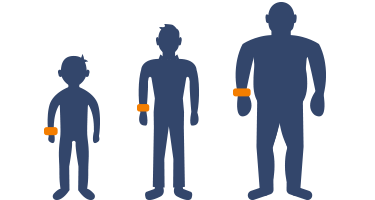 If you would like a cut-out for measuring sizes on your wrist, print the Reminderband® Sizing Document. If you have special requirements requiring especially large or small bands, call Customer Service at (800) 922-5401. The Classic is by far our most popular wristband. Buy with or without colorfill (colored text). This wristband comes in a variety of colors including several camo colors. 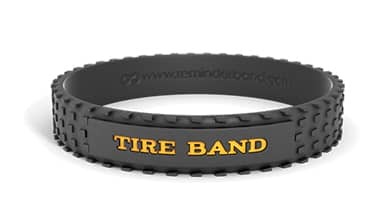 Our Tire Wristband is made from 100% high-quality black silicone and is molded like a tire tread. 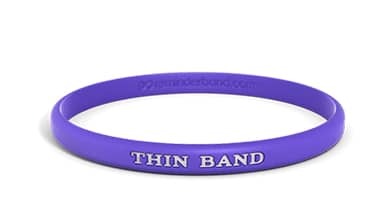 The inside is smooth, so the band is comfortable and easy to wear. We can also add a space for your own artwork or text in debossed or color-fill. 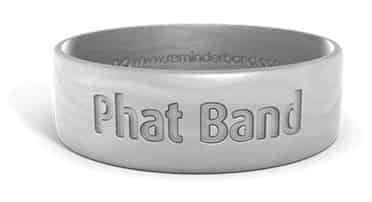 Our 100% silicone "phat" bands are 3/4" wide and 50% wider than our regular band, for a bigger, bolder look. The extra width gives room for impressive designs and makes it a more visible band. Our dual-layer wristband is made from two layers of 100% silicone fused permanently into one band. The top layer is etched to create a unique, three-dimensional design by revealing the color underneath. It's a dramatic, crisp look on a strong, durable band. Made from 100% silicone, our heart-shaped bands maintain their shape on or off the wrist and are both flexible and durable. 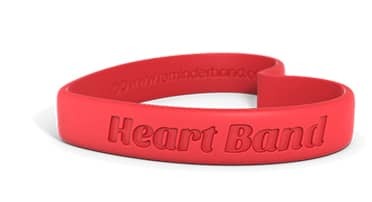 Heart bands are a great way to show love or support a cause in a way that stands out from the crowd. The contour is much thicker than a traditional Classic and has more of a jewelry feel to it. This is our large Classic with a crimp and stainless steel ring for your keys. Its large profile makes it easy to find. The silicone is durable and will last for years. Get it in glow-in-the-dark to make your keys easier to see at night. 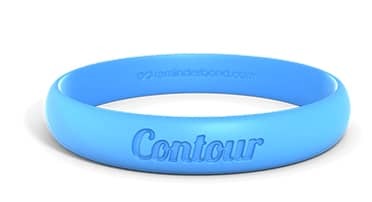 Order either 2 or 3 colors of silicone mixed together to make a truly unique wristband for every person you distribute them to. Thousands of combinations are available. One of our most popular wristbands, the Marquee Rectangle features an area that highlights your message. Popular for medical alert bracelets. Similar to the Marquee Rectangle, the Marquee Oval sports an area that showcases your message. We have a neat print style for this band where you can request curved text and a logo or art in the center, which looks stunning. 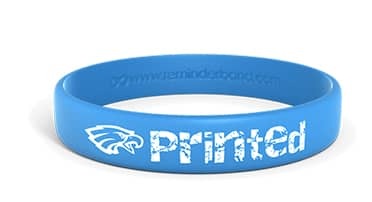 Our printed wristbands come with one free color and free printing on the back. If you are looking for the most economical wristband with color, look no further. Need more than one color of text? Add additional colors for $20 each. We created the Puzzle wristband to address the needs of those raising awareness for autism. The silicone-injected puzzle pieces create a one-of-a-kind autism bracelet that is sure to create awareness for your cause. Mix and match two or three colors that are vertically fused together. 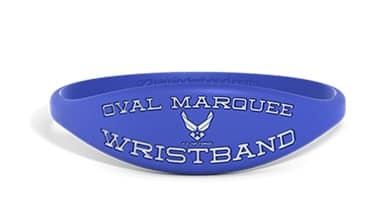 Choose your school or team colors to make a very attractive wristband. Choose from our stock two and three-striped wristbands for emergency responders, patriotism, and more. Our thin bracelet is sporty and subliminal. 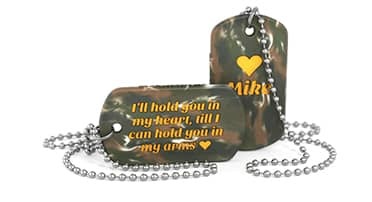 Our dog tag necklace is durable and has plenty of room to imprint your key information or message. Or, choose our keychain with the same features but a shorter chain. With a large caduceus on the front, emergency responders will quickly be alerted to your condition, allergies, and medicine requirements. We offer both a necklace or a keychain. 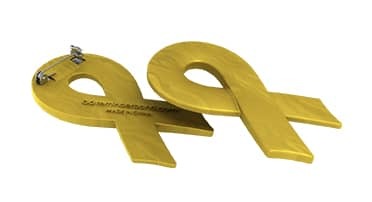 Molded to perfection, our ribbon keychain has nice form and function. Even have your name or special phrase debossed on it. Ready for something new to portray your cause or message? 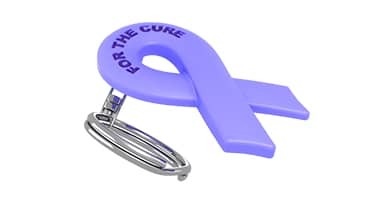 The ribbon pin is easily seen worn on your shirt or blouse and presents a unified feeling at your event.